Sicilian Food and Wine - Sicilian Cuisine - Best of Sicily. Wines of Sicily, Sicilian Cheese. 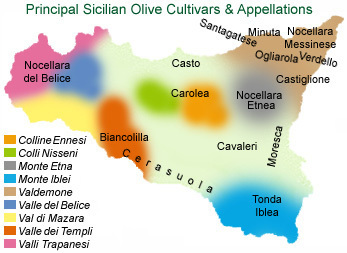 Sicilian wines and Sicilian olive oil described. Sicily cuisine, Sicilian Recipes, Sicilian culinary history, wine tours. Sicilian Food & Wine. 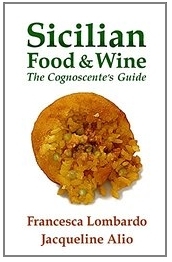 A simple, practical guide to the en­chanting world of Si­cilian cuisine, with chapters on wines and olive oils, and a few simple, time­less recipes. Real in­forma­tion for real people. (224 pages on acid-free paper, ebook available) Read more. Food & wine tours of Palermo at your own pace. Discover 30 centuries of delicious culinary history. Sicily's aristocratic cuisine in an elegant and inviting atmosphere. Join us for dinner... Visit our site for more about Cin Cin. Purchase fine wines from Sicily directly from the winery for sale in your wine shop or restaurant. Sicilian wines for wholesale export anywhere in the world. Welcome to the most complete online presentation of Sicily's culinary heritage. Cuisine is a reflection of a place's culture. Some would suggest that cuisine is a culture unto itself. In our growing list the "categories" are fairly precise and topics are cross-referenced. We've included most of our culinary articles. Some of these articles contain recipes. For culinary seasons and harvests, see our weather and climate page. There's no doubt about it. Food and wine are among Sicily's main attractions, and you may have sampled something of both long before arriving in Sicily. When most people think of Italian food, pasta and pizza come to mind. But Sicilian cuisine, and the Mediterranean Diet, transcends these ubiquitous culinary delights. If you plan to go on a diet, go to Sicily first. (You can always diet later.) Here are a few specialties to sample while you're here. Don't forget to visit our Sicilian Recipe and Sicily Restaurant pages. Satiate your sweet tooth on the Pastry page, which lists cafés and pastry bars in Palermo. The Magazine features articles about Sicilian cuisine --things like cheeses, pasta, artichokes, open air markets, wine reviews, wild game, olive oil tastings and more. See our links page for things like cooking lessons, wine tastings and culinary tours. Caponata, a tasty salad made with eggplant (aubergines), olives, capers and celery, makes a great appetizer. There is also an artichoke-based version of this traditional dish, though you're less likely to find it in most restaurants. Sfincione is a local form of pizza made with tomatoes, onions and (sometimes) anchovies. Prepared on a thick bread and more likely found in a bakery than in a pizzeria, sfincione is good as a snack or appetizer. Panella is a thin paste made of crushed or powdered ceci (garbanzo) beans and served fried. Maccu is a creamy soup made from the same bean. Crocché (croquet) are fried potato dumplings made with cheese, parsley and eggs. Arancine are fried rice balls stuffed with meat or cheese. 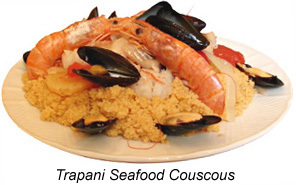 Sicily is renowned for its seafood. Grilled swordfish is popular. Smaller fish, especially snapper, is sometimes prepared in a vinegar and sugar sauce. Seppia (cuttlefish) is served in its own black sauce with pasta. Another Sicilian seafood dish made with pasta is finnochio con sarde (fennel with sardines). Meat dishes are always popular. Many are traditionally made with lamb or goat. Best known outside Sicily is vitello alla marsala (veal marsala), one of many regional meat specialties. Chicken "alla marsala" can be prepared using a similar recipe and method. Milza (veal spleen) sandwiches are a bit "native" for most tastes, and loaded with cholesterol, but delicious anyway. Sicilian desserts are superlative. Cannoli are tubular crusts with creamy ricotta and sugar filling. If they taste a little different from the ones you've had outside Italy, that's because the ricotta here is made from sheep's milk. Cassata is a rich, sugary cake filled with the same delicious filling. 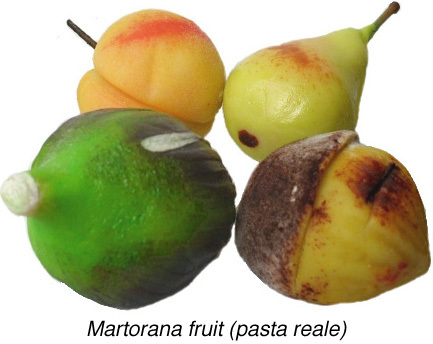 Frutta di Martorana (or pasta reale) are almond marzipan pastries colored and shaped to resemble real fruit. Sicilian gelato (ice cream) is excellent. In fact, it is possible that ice cream was invented in Sicily during Roman times, when a relay of runners would bring snow down from Mount Etna to be flavored and served to wealthy patricians. You'll find flavors ranging from pistachio and hazelnut (nocciola) to jasmine (gelsomino) to mulberry (gelsi) to strawberry (fragala) and rum (zuppa inglese). Granita is sweetened crushed ice made in Summer and flavored with lemons or strawberries. And don't forget our restaurant reviews. Buon appetito! While this isn't a complete list, we've tried to include some words and phrases typical of Sicilian menus. anguilla --freshwater or sea eel. anguria --red water melon, also rosso melone. arancine --fried rice balls filled with meat. arborio --creamy white rice native to Italy's Piedmont region. babbaluci --small snails (in Italian, lumache). baccalà --cod fillets in salt or water. bar --drink and coffee shop, as distinguished from a pub. beccafico --fresh roasted herring (sardines) stuffed with a delicious mixture of traditional ingredients. birra bionda --light beer or ale, as distinguished from dark beer (stout or bock) or red beer. bocconcini --any meat, bread or cheese formed into small pieces. bruschetta --toasted bread topped with chilled chopped tomatoes, onions, olives and herbs. buccellato --a crusty winter cake having a sweet filling of figs and nuts, sometimes cut into sections or formed into cookies. caciocavallo --a local cheese made from sheep's milk. cacocciulo --Sicilian for carciofo, artichoke. caffétteria --coffee shop ("bar" being the term usually used in Sicily), sometimes refreshments. calzone --bread roll baked with ham, cheese or other stuffings. cannolo --pastry having a tubular crust filled with ricotta cream filling. caponata --cold salad of eggplant (aubergines), capers, olives, celery and tomatoes. A variation is made with artichokes instead of eggplant. capricciosa --a pizza made with numerous ingredients, including tomatoes, mozzarella, ham, artichokes and other toppings. cardo --also cardu or cardoon. The celery-like stalk of the artichoke leaf. cassata --cake or tort of sweet ricotta cream filling in a crust of frosting and candied fruits. cena --usually supper (evening meal) but sometimes a large lunch. chitarre --literally "guitars," spaghetti whose shape is square rather than round, so-called because it is formed by running the soft paste through a series of wires similar to the strings of a guitar. cipollata --glaze of onions, vinegar and sugar used as sauce for certain fish dishes. condimento --condiment; usually refers to the toppings on a pizza. contorno --a side dish, usually in addition to the salad. coperto --nominal cover charge added to restaurant bill; this is not a tip. cornetto --light breakfast pastry similar to a croissant. cremeria --an ice cream shop, in Sicily gelateria is the more common term. croquet --fried potato and cheese dumplings. cuccìa --sometimes cucchia; traditional winter pudding made from hard wheat, somewhat similar to rice pudding. Served on Saint Lucy's Day, 13 December. cus-cus --Italian spelling of couscous. fava --a flat broad bean grown in Sicily. finnochio --fennel. The term actually refers to the "wild" variety, unrelated to the anise greens often sold as finocchio nowadays. focaccia --a seasoned bread, quite similar to a thick pizza, but flavored with olive oil and herbs instead of vegetables and cheese; in Sicily, most focaccerias (focaccia bakeries) serve focaccia but also sfincione. frascatela --a doughy dumpling paste of cauliflower and bacon. friggitoria --food stand specializing in fried foods such as panella, arancine, croquet, etc. fritedda --vegetable dish or pasta sauce made with fresh green fave beans, peas, and sometimes artichoke hearts and scallions. frutti di mare --seafood, such as shellfish. gamberoni --large shrimp or prawns. gattò --from the French gateau, describes food in the form of a soft cake similar to quiche. gelateria --an ice cream shop. gelato --ice cream, whether made with or without milk. gelo di mellone --sweet gelatine dessert made from water melon, served in Summer. gelsi --mulberry, a Summer ice cream flavor. gelsomina --jasmine, an ice cream flavored with this flower. giri --refers generically to any of several spinach-like vegetables but particularly to one resembling bok choy, with dark leaves and a white stalk. gorgonzola --Italian bleu cheese, named for the city where it is made. granita --crushed sweetened ice flavored with lemon, strawberries, mint and sometimes mulberries (gelsi). grappa --strong brandy distilled from grape pumice and seeds. griglia --grill; alla griglia refers to grilled dishes. insalata mista --salad of lettuce and other vegetables. insalata riso --cold rice salad, a Summer dish. involtini --grilled or roasted chicken or beef slices stuffed with vegetable or meat filling; also leafy vegetables (such as radicchio) stuffed with meat filling. latte di mandorla --literally "almond milk," carbonated milky white drink made with sweetened almond paste and almond extract. limoncello --generic name for a sweet lemon liqueur. maccu --also macco, creamy winter soup made from dried fava beans and fennel. margherita --a pizza made with tomatoes, basil and mozzarella. marsala --dark fortified wine similar to Port, named for the Sicilian city where it is made; alla marsala refers to meats prepared with this wine. martini --sweet white or red vermouth; unless the term "cocktail" is specified, this is not the cocktail of this name (containing dry vermouth with vodka or gin) but the vermouth itself. milza --sauteed veal spleen, usually served in sandwiches. naturale --natural; describes mineral water that is not effervescent; "still water." neonata --baby sardines (a few days old) served as a sauce or fried. nero di seppia --cuttlefish (seppia) ink and the black sauce made from it. nocciola --hazelnut, an ice cream flavor. osteria --literally a tavern or inn, but usually a trattoria. panella --salty flat fried cakes made with ceci bean flour, often served as an appetizer. pasta al forno --pasta baked with beef, tomatoes and cheese; similar to baked lasagne. pasta reale --almond paste marzipan pastries decorated and colored to resemble fruits and various objects; sometimes called "Frutta Martorana" in Palermo. pecorino --describes ricotta and certain other cheeses made from sheep's milk. pesto --green pasta sauce made with ground, crushed basil and pine nuts. pizzaiola --describes certain dishes, such as some sausages, and even potatoes, made with a variety of vegetable ingredients and spices. pizzeria --restaurant specializing in pizza and certain fried foods. primo --also "primo piatto," first course, usually a pasta or rice dish. primo sale --a sweet Sicilian cheese. pub --British style pub or American style bar. quattro formaggi --a pizza made with four cheeses, usually mozzarella, bleu (or gorgonzola), parmesan and a local cheese. reginelle --small cookies coated with sesame seeds. ricci --urchins, usually served raw. ricotta --cottage cheese, which in Sicily is made from sheep's milk. risotto --describes various arborio rice dishes. ristorante --usually a more formal restuarant which serves evening meals and sometimes lunches, as opposed to a trattoria or pizzeria, which would be less formal. rollò --roast made of beef stuffed with meats, cheeses and vegetables. salsa verde --any green pasta sauce similar to pesto. salsiccia pizzaiola --sausage stuffed with pork, onions, tomatoes, mushrooms and other vegetables. sarde --fresh small herring (sardines), usually served stuffed ("beccafico") or with pasta and fennel ("pasta con sarde"). secondo --also "secondo piatto," second course, usually the main meat dish. semifreddo --whipped dessert similar to mousse. sfincione --a thick Sicilian pizza topped with tomatoes, onions and anchovies; rarely served in pizzerias but available in focaccerias, some bakeries, or from street vendors. To Sicilians, sfincione is not considered "pizza," which in Italy is by definition thin and crusty. sfingi --also sfinci, fried puffed dough ("cream puffs") filled with cream (especially the "sfingi di San Giuseppe" served on Saint Joseph's Day, 19 March) or coated with honey. Singular is sfincia. siccia --Sicilian for seppia, cuttlefish. sparacelli --a tasty broccoli variety similar to the undomesticated broccolo. spiedini --meat and vegetables served on a skewer, similar to shish kebab. spremuta --freshly-squeezed orange juice, as distinguished from succo d'arancia, the bottled variety. stigghiola --seasoned and barbecued lamb or kid intestines served on a skewer. tonno --tuna or tunny; this is a tasty dark Mediterranean variety served fresh, nothing like the canned white tuna sold in supermarkets. torrone --an ice cream flavor based on this candy made with honey, egg whites and nuts. trattoria --an informal restaurant which serves evening meals and lunches. triglie --also "triglie di scoglio," red mullet, best in April and often served in a sweet sauce of vinegar and onions. tunisini --a variety of eggplant (aubergine) having a light purple skin and a very white flesh. vergine --literally "virgin," this term describes a pure grade of olive oil made from the first cold pressing of the freshly harvested olives. zuppa inglese --rum mix, an ice cream flavor. Carolea, Nocellara, Biancolilla: Their names roll off your tongue. It's difficult to think of Sicilian food without thinking about Sicilian olive oil - or, for that matter, the wines of Sicily. In the beginning... Sicily's olive varieties trace their origins on this island from time immemorial, with the first oleasters and (much later) the Greek kalamata, probably the first domesticated cultivar brought to Sicily - preserved today as a single ancient tree in the eastern part of our island. Sicilian olive oil is among the world's most fragrant and appetizing. To categorize it generically among "Italian olive oils," as though you were filling out a customs declaration, is to overlook its unique qualities. It is believed that Sicily's particularly fertile soil, which in eastern regions is volcanic, produces some of the world's best olives. The ancient Athenians preferred Sicilian olive oil to their own, though some of the varieties grown in Sicily and Greece were actually the same. A Question of Colour: The question of color should be put to rest. A persistent perception holds that the greener its color, the purer the olive oil. This is generally true for most varieties of olive oil, but it must be said that certain varieties of olive yield a slightly more golden oil. Like grapes, olives come in different colors. Olives may be green, grey or black when ripe, depending on the variety. Curing does not alter the basic color of the olives, but only deepens it. Certain types of olive tree grown in Calabria's Aspromonte region are tall and thin, producing a small dark fruit from sparse branches. The Sicilian trees are usually shorter with somewhat dense foliage. This makes it easier to pick the olives by hand, which causes less damage to the trees than mechanical harvesting. Pressing Method: There are two ways of pressing olives to draw the oil out of them. Cold pressing uses a natural process, with no heat, to extract the first oil from the freshly harvested olives. This product is often called virgin or extra virgin olive oil. When it is unfiltered, it has a foggy consistency and a grayish sediment. To purists, this is the best grade of olive oil, and it is ideal for salads. However, the virgin olive oil sold in stores is usually filtered, and beware of "virgin" oils produced outside the European Union, where the term may be defined only vaguely. Most olive oil is "refined," meaning that it is extracted, sometimes with a heat process, from the olive husks that remain following the initial "cold" pressing. The quality of such "olive husk oils" is not that of the extra virgin kind, but of greater concern is some nations' legal laxity, which may permit the introduction of a certain percentage of seed oils while still allowing the mixture to be sold as "pure" olive oil. A vaguely defined product called "lite" olive oil, though pure, is a marketing gimmick that permits American firms to sell low grade, less flavorful, highly refined olive oil as though it were better for your health or tastier in recipes. These are misleading claims because research has shown that pure virgin olive oil (whatever its geographic source) is one of the best oils you can consume. Why would any chef prepare a salad using a bland product that doesn't taste like traditional cold-pressed olive oil? Virgin olive oils are usually less acidic than refined ones. Quality: Apart from its purity and the extraction process used to produce it, olive oil is distinguished by its acidity. In general, the lower the acidity, the better the oil. For an idea of what we're talking about, try biting into a raw green olive sometime. It's tart and bitter, to say the least. It is true that cold pressed, unfiltered olive oil is typically more acidic than the filtered kind. Truth be told, even a relatively high acidity level would not be very obvious or unpleasant unless you were consuming the oil alone, without any other food or seasoning. For commercial sale, however, Italian extra virgin olive oils must have an acidity level no greater than one percent, and many boast a level far lower. To be designated "organic," an Italian olive oil must be made from olives grown on trees which have been free from chemical agents for at least three years. This conforms to European Community and Italian national directives. Olive oil is also graded by its thickness, or viscosity, though this does not imply a judgment of its culinary quality. Unfiltered oil is naturally denser, and more opaque, than filtered oil. The first seasonal pressing, available by early December, is sold in much the same way as novello wine. When olives are pressed, the pits (stones) are crushed as well, but a new process entailing removal of the stone before pressing yields a better oil. Actually, we shouldn't call it a "new" process, since evidence indicates it was employed by the ancient Greeks. By Any Other Name: Italy is the world's largest producer of olive oil, but olive varieties are not identical. Several traditional olive varieties have been grown in Sicily for a very long time, and are preferred to hybrids - of which there are many. Verdello is a large green olive. Biancolilla is favored in southwestern Sicily, Nocellara Messinese and Ogliarola Messinese in the northeast. Crasto is grown in the lowlands of the Madonie Mountains of northern Sicily. Cerasuola (Ogliara) is raised in the vast area between Sciacca and Paceco. La Minuta is grown in the area of Patti and Capo d'Orlando in the province of Messina. La Cavaleri is raised in the Caltagirone area, Biancolilla around Agrigento. The Tonda Iblea variety is raised around Ragusa, while Moresca is grown in the triangular zone formed by Catania, Siracusa and Ragusa. Castiglione is native to the volcanic Alcantara Valley near Taormina. Nocellara del Belice is raised in the Trapani area, Carolea in the Enna region. Some varieties are better for salads, others for pressing. Castiglione, Biancolilla, and the various Nocellara varieties, for example, are better for pressing. Appellation: In theory, like Sicilian wines, olive oils should carry an appellation indicating where the olives pressed to make it were grown. While the law favours appellations by region over the varieties of olives used to make the oil, there are guidelines for these, so a Valle del Belice oil should be made primarily from olives traditionally typical of that area. These appellations follow. • Colline Ennesi - Hilly region around Enna in east-central Sicily, generally contiguous to that province. Carolea is principal variety. • Colli Nisseni - Mountainous region around Caltanissetta in eastern Sicanian Mountains. Carolea and Biancolilla are chief varieties. • Monte Etna - As the name implies, the areas on the slopes of Mount Etna, fruits of its rich volcanic soil. Range of varieties includes Nocellara Etnea, Moresca, Tonda Iblea, Ogliara Messinese, Biancolilla, Brandofino and Castiglione. • Monte Iblei - Region of the Hyblaean Mountains of southeastern Sicily. Preferred varieties are Tonda Iblea, Moresca and Nocellara Etnea. • Valdemone - Generally contiguous to the province of Messina, including much of the Nebrodi region. Various varieties including Ogliarola Messinese, Verdello, La Minuta, Nocellara Messinese, Ottobratica, Brandofino, Verdello (subspecies of San Benedetto). • Valle del Belice - The Belice Valley south of Trapani, principally Nocellara olives but also Biancolilla, Cerasuola (Ogliara), Buscionetto (Biancolilla), Santagatese. • Val di Mazara - Southwestern area. Preferred varieties are Biancolilla, Cerasuola, Nocellara del Belice. • Valle dei Templi - The area in the immediate vicinity of Agrigento. Principal varieties are Biancolilla and Cerasuola (Ogliara). • Valli Trapanesi - Large region around Trapani in western Sicily's wine country. Principal varieties are Cerasuola and Nocellara del Belice. Buyer Beware! Unfortunately, there are unscrupulous Sicilian firms that use olives from Calabria, Apulia or other parts of Italy to make the oil they press in Sicily. To make things worse, many of the best known "Italian" olive oils, even those classified "extra-virgin," are actually produced from olives imported from Spain, the Balkans, Turkey and Tunisia. Though much of the "Sicilian" olive oil sold in the export market is not made from locally-grown olives, under European Union law there's little accountability for the precise origin of the product. In some cases the olives are pressed abroad (outside Italy) and the oil is imported into Italy for bottling as "Mediterranean" oil with little regard for precise extraction standards (superior cold pressing versus inferior 'refining') or quality. Much is lampante, an oil pressed from dried, dirty olives found on the ground rather than harvested from the trees. Most lampante is also 'rectified' with chemical agents in order to control its acidity; sometimes such oil is extracted - in the case of Spain and Tunisia - using agents such as talc. There are no import controls for oil which arrives in Italy from other EU countries. Incredibly, much of the olive oil sold in Italy is not Italian! A controversial 1995 law permits much lampante oil to be sold as 'extra virgin.' The scandal is too complicated to explain in detail here. Caveat emptor! Best Sicilian Olive Oil: Every two or three years, the editors of this publication gather a panel of culinary experts to judge Sicily's best olive oil based on ten or more brands from around the island. Olive Products: The oil is only one of the products of the olive. There is also green, grey or black olive paté, a delightful spread for sandwiches or appetizers. And, of course, there are both cured and dried olives. Some firms market their own oils, pressed from olives grown on their own farms. More often, the company that bottles and sells the oil has purchased the harvests of numerous growers.